Daviess, Dubious [sic], Knox, Martin, and Pike Counties in Southwest Indiana belong in the Eastern Standard [sic] time zone. this is my favorite kind of typo: one where the misspelling becomes a different word, with unintended humorous connotations. my professional intuition tells me that this error was most likely caused by an overzealous spell-check: msword suggested "Dubious" instead of the correct "Dubois" and some flack mistakenly clicked "replace". but that doesn't make it any less entertaining. personally, i have a passing familiarity with dubois county, as my mother got her master's degree at st meinrad in nearby spencer county, so i've been to jasper a few times, and dubois struck me as a perfectly nice rural county. so i'm not hating on dubois, though if i were, i would have some awesome new ammunition. 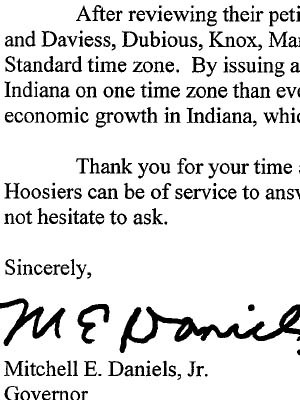 doug pointed out this typo in the middle of a longer post about the governor's letter, supporting six counties in their bids to switch to eastern time after having been put on central earlier this year. doug's post has some excellent analysis of the letter, examining the governor's disingenuous arguments and false claims. if you're not bored to tears with time zone talk, you should read his post: i won't do it the injustice of rehashing all his points here. spencer county is where i lived from 6th grade through h.s. graduation. the parents still live there. Poor Dubois county; I'll bet they heard that all the time when they were growing up, probably in the lunch room when all the other counties were sitting around whispering, "Oh look, there's 'Dubious.' There's some question about whether he's even an county at all!" I love that Daviess has two "S" at the end - that looks strange to me.